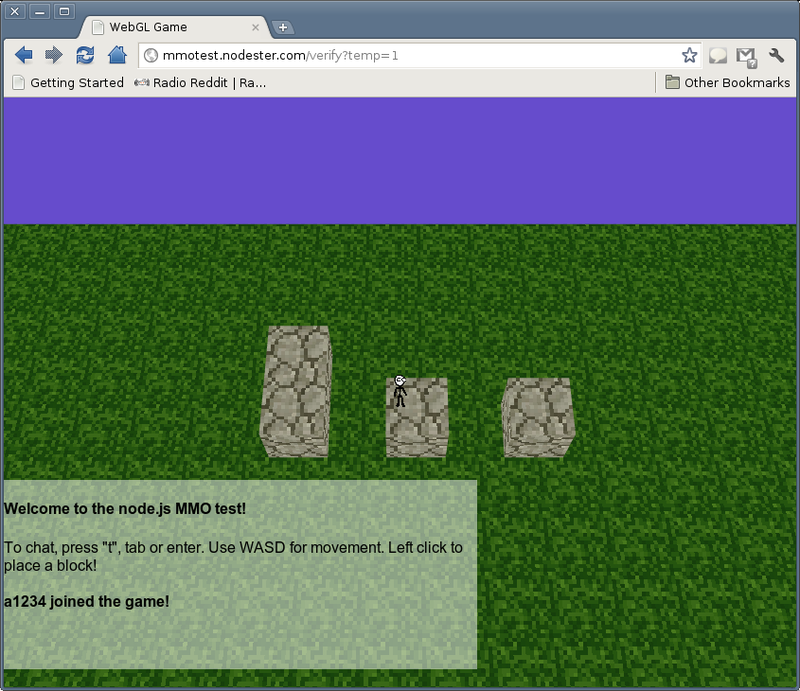 The URL for the game is http://mmotest.nodester.com . Right now I am using the freebie hosting coupon for nodester, but I have no idea how much longer it will last. The database hosting is from mongolabs, and so again is fairly limited. However, this does show that you can build something like a minecraft game in the browser pretty easily. Of course the latency with a shared hosting provider like nodester starts to become a bigger problem as you get more players in the game. I will try to post the source code once I get a chance to clean some things up. I am having some issues configuring the nodester deployment so that I don’t have to hardcode in various strings like the database password. Unfortunately, for the life of me I can’t figure out how to pass those sort of config things in on the command line via nodesters REST API, and so for now they are just stored in version control. Once I can figure out how to remove this information, I will make the github repository public so that others can try it out. On the other hand, if I can’t solve the problem I may try just do something irresponsible like release a repository with all the passwords in it and let everyone go crazy hacking my demo accounts. If you do go somewhere with this, consider heroku.